I didn’t see a thing from this show. Opener sounded like Fiero was back to normal. No angles at all. I have been a bit too obsessed with the latest crazy GFW story this morning, but I assume this will have no short term affect with their relationships with AAA or The Crash in the short term. Sales or whatever else take time to happen if one is even going to happen here and they’ll probably continue working with the Mexican promotions in the meantime. AAA wrestlers continue to appear on Impact – Pagano debuts either tonight or rather soon. WrestleCon announced The Crash will have a show in New Orleans on Friday of WrestleMania weekend. (That’s April 6th.) It’ll be their first show as part of the weekend and in the US at all. There have been attempts at an AAA or Lucha Underground or a The Crash show for years, so it’s an achievement to get it actually done. I’m figuring there will be a bunch of luchadors working shows that weekend, with CMLL wrestlers working at least the ROH shows and probably indie guys also appearing. AAA on UDN switched to showing one hour highlights from past TripleManias with last night’s show. They aired matches from 2013 last night, which means probably the next three to finish the week and this year’s show to on Sunday. I wonder what they’ll do with 2015, since the big matches all involve people who are not working there and aren’t going back any time, but are big names. +LuchaTV talks to Princesa Sugehit about her mask match. Here’s a thing I’m going to hide here: I have no strong feeling on who’s going to win that match. I had a strong feeling about Wagner/Psycho (and was totally wrong), and I have a strong feeling about Niebla Roja and Gran Guerrero (and may be wrong again! ), but I don’t have any idea on the women’s one. I believe there will be at least one more Aztec Medallion match on the show. There will also be Dario with an announcement for Rey Mysterio (recall, he hasn’t told Rey he’s facing Matazna next week) and Johnny Mundo adding something to his match Prince Puma. CultIcon writes about the Cortez Castro/Joey Ryan feud. The ROH London show with the Kushida/Titan match that got really strong reviews is up on ROH’s site as a $15 PPV. I think it’s up on NJPW World too, but only for people with Japanese IPs. Puma King will be back on Powerbomb.TV as part of their 10/22 show, facing John Silver. This week’s Zona Ruda has Dragon Solar & Ashley on as guests. 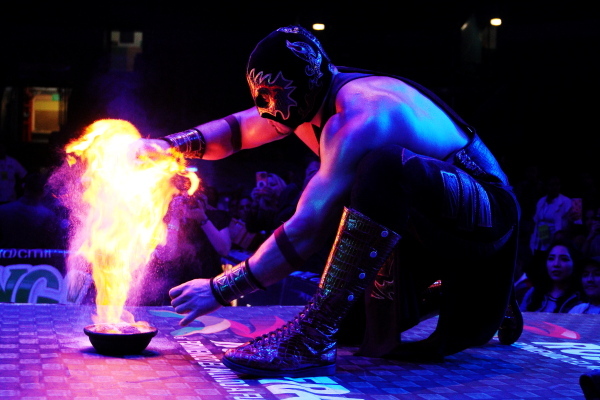 CMLL writes up Octagon’s debut. He’s on Informa today. Gran Kenut & Leon Blanco won the Pacific Coast tag team titles. The Gladiatores has interview with Eterno, Bombero Infernal, and Demonio Infernal following the hair match. The newest edition of Lucha Talk is up. Looks like I talked about this lineup but didn’t post it. We already know the original one was wrong, but it might be simple as a typo since Parka is already listed in the Latin American mess. I’m guessing this lineup was mostly figured out before TripleMania, but they’ve got large group matches all over the place after the large group match at TripleMania was a mess, and Mesias & Pagano main eventing after the TripleMania match was not any good. And I’m really not sure why Texano & Hijo del Fantasma needed to club each other in the head if they’re just doing a four way again. WWE tropes, which seem heavily in play here, would suggest Mundo either keeps all three titles or loses all three titles, nothing in between. (It would be to AAA’s benefit to play up the idea Mundo’s leaving after this show.) Maybe Mascara de Bronce, La Parka and Kross as new champs? Dinasita being involved with Marty and in the Latin American division might be the promotion out of the near dead minis division we’ve hoped for. Guessing Ricky taking the loss in the cage match. Think Sugehit’s losing, she’s won all but one of the matches with Zeuxis in the build up including taking the title. Won the Natalia Vazquez cup too beating Zeuxis last. unless they’re totally burying Zeuxis it’s time for her win.